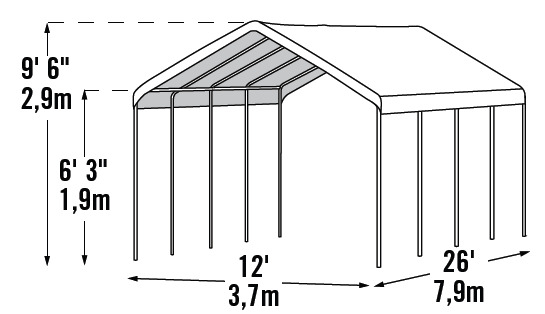 This is a field-tested, commercial grade, heavy duty shelter. 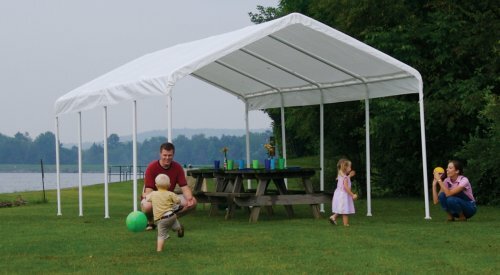 When you need or want the best get this commercial grade canopy shelter. All this quality and durability can be had at a surprisingly low price. The frame is a welded 2-inch steel that is field tested and will withstand extreme weather condition. Twist Tite technology will allow tensioning to give the frame a taught tightness and give the cover a wrinkle free look. Instructions are included. It's great. Easy to set up with 2 people. You can get a new top. Have mine for about 6 years still works great at events. Easy to put up and withstands the winds, wish the poles were a little more sturdy. ProsSize and great value, easy to put up and take down. This has a heavy duty frame and all the pieces were included in the box. The instructions for assembly are not quite clear, but the pictures help out in getting the right pieces together. This is large and definetly not a one man job because I was beat by the time I got done alone. I ended up removing the bottom half of the legs so I could get the cover on and then putting the legs back on. If you want it to stay in place for some time, mobile home anchors will keep the feet on the groumd, even in a strong wind. There are some pins included to keep pole halves together. I also bought 1/4 in. bolts and wing nuts to couple all the corner pieces and poles together. I don't want anything coming apart. All in all, a very good canopy for the price. I would have preferred a cloth canvas canopy to the lightweight one, but that would make it extremely heavy.